Dr. Reilly grew up in Norwich, Connecticut and has lived in western Mass for the past five years. She and her family recently moved from Springfield to East Longmeadow. 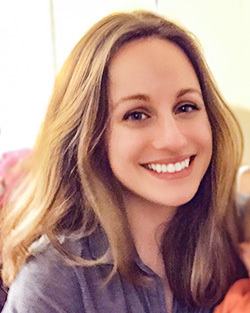 Dr. Reilly completed her undergrad studies in biology and French at Swarthmore College outside Philadelphia before returning to Connecticut to attend dental school. She earned her D.M.D. as a Dental Deans' Merit Scholar at UConn in 2011. She completed an Advanced Education in General Dentistry program at UConn where she received advanced training in topics including oral surgery, endodontics, implants, and digital dentistry before moving to western Mass and beginning private practice in 2012. Dr. Reilly is a member of the American Dental Association, the Massachusetts Dental Society, and the Valley District Dental Society. She places a high priority on continuing education and has taken occlusion courses at the Dawson Academy in St. Petersburg, Florida. Dr. Reilly and her husband Steve have two children: Caroline, age 8, and Jack, age 1. She is a runner and enjoys designing and sewing clothing in between soothing toddler tantrums, driving to soccer practice and applauding too loudly at ballet recitals. Dr. Reilly looks forward to serving her patients in her new hometown of East Longmeadow with compassion and skill.